The Tour du Mont Blanc is one of the World’s most famous and greatest hiking trails in the world. You will get the chance to experience the best of the Alps;hiking past steep ridges, glacial lakes and flower-filled meadows in France, Italy and Switzerland. 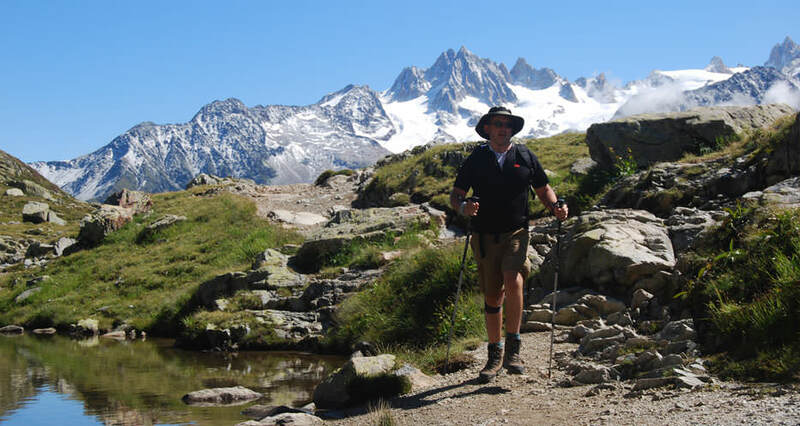 This spectacular trail will take you around the whole Massif du Mont Blanc. You will hike across high passes, through Alpine meadows and valleys rich in vegetation. You’ll pass through pretty towns and villages with shops where you will enjoy local foods and specialities. Chamonix, France: this is our starting point of the TMB and has been a magnet for mountaineers, explorers, scientists and hikers for centuries. With a good range of hotels and restaurants, friendly atmosphere and pavement cafés, it is great place to hang out. Champex, Switzerland: the French speaking side of the Switzerland. It is a typical picture-postcard Swiss village with restaurants and bars and a fabulous view of its lake. La Fouly, Switzerland: Has small ski resort, with some basic facilities: a few hotels and bars and one minimart. Courmayeur, Italy: the view of Mont Blanc is spectacular from this side of the mountain. It is much steeper and foreboding. The town has some lovely restaurants and cafés where you can enjoy traditional Italian specialities. How should I pack for each day? We will transport your luggage from hotel to hotel, so you only need to carry stuff that you will need for that day. If there is a night where you do not have access to your main luggage, you just need to pack some over-night essentials such as basic toiletries, spare underwear, socks and T shirt. How old should I be to participate on the Tour du Mont Blanc? Age is no barrier to taking part in the TMB: you just need to be fit enough. Our previous clients have ranged in age from 14 to 76 years. However, children less than eighteen years of age should be accompanied by an adult on the trip.